The Spa at 500 project is located at 500 West Onondaga Street. The Spa has partnered with Save the Rain through the Green Improvement Fund program, to reduce the effects of stormwater runoff in the combined sewer system in surrounding the areas. This project consisted of constructing a 1,700 square foot green roof. The roof was comprised of approximately 5 inches of engineered soil/growth medium and various species of plants, specifically chosen for the project and area. The capture area the green roof is approximately 5,600 square feet. 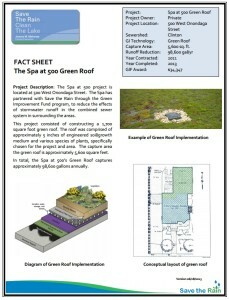 In total, the Spa at 500 Green Roof captures approximately 98,600 gallon annually.